Don’t let that gorgeous cover fool you. This a super creepy and crazy book. But in all good ways. After my daughter and I read The Beast is an Animal, we knew that whatever Peternelle wrote we wanted to read it. 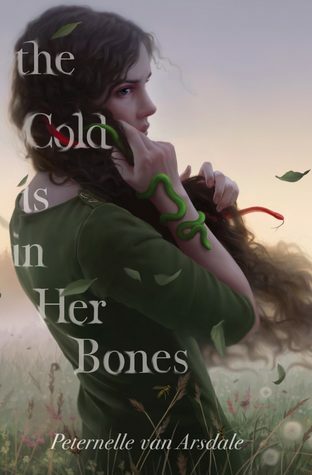 So when I was lucky enough to receive an ARC of The Cold is in Her Bones I was through the roof with excitement. And to find out it has a Medusa feel, well then SIGN ME UP. Milla has been raised in a far off house, away from the towns. She’s not allowed to go anywhere and is raised to be a helper of those who are older than her. She always seemed to do the wrong things and upsetting her parents. When a new girl arrives at a neighbors house she finds hope. Hope of a friend and maybe even a sister. But Iris is keeping a secret from Milla, in the hopes that will keep her safe. But of course that doesn’t last. When Iris is “infected” and is sent away, Milla is determined to find her and bring her back home. Her journey is one of self discovery. She isn’t as safe from the demon as she hoped, but for the love of her sister of her heart she is willing to travel far and wide and find a way to save them both. Friendship and familial love was a thread woven throughout this story. Milla broke free from what was expected from her in order to find her own way and take charge of her own life. There were trials and struggles but for love you’d go through anything. Even face a demon. Girls who run from what frightens them don’t get what they want. As I was reading this, I kept thinking of my own daughter. She’s the strongest girl I know. She won’t let anyone control her or hold her back. She wants to try everything and if mistakes are made, she owns them and learns from them. And since she LOVED The Beast is an Animal, I know she will love this as well. I can’t wait for her to read it!